Perfect Pancakes In Seconds Without the Mess! Love Pancakes but hate the mess and lengthy clean up? Pancake express is the all-in-one solution to delicious, mess-free pancakes. 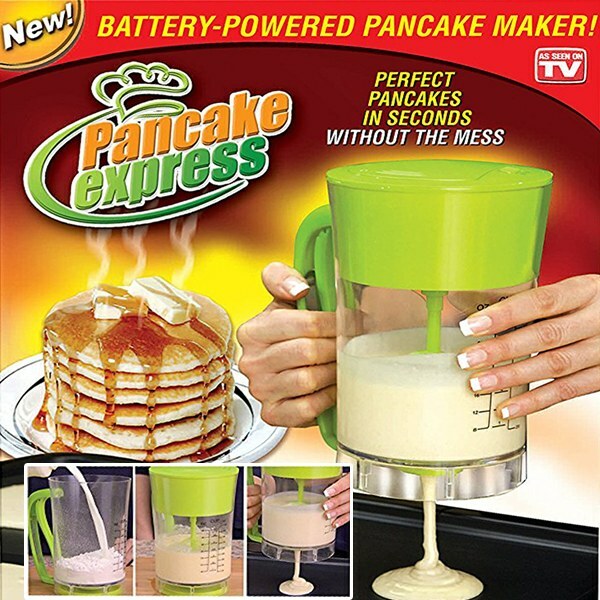 Pancake express is a battery-powered pancake measure, mixer & dispenser. Simply add your ingredients to the built-in measuring cup and press the button to stir. Pancake express&apos; design creates lighter, fluffier & lump free batter every time in seconds! When you&apos;re ready to cook, hold your filled Pancake Express over your cooking device and squeeze the handle to easily dispense the perfect amount! When your finished, Pancake Express fits perfectly into the dishwasher for quick and easy clean up. Got some extra batter? No problem! Pancake Express is the perfect way to store extra batter in the fridge until you&apos;re ready to finish it off! If you love pancakes, then pick up Pancake Express today!